One Successful Winter Reading Program! What do 85 days + 42 people + Over 498 books + 4 big prizes make? ONE pretty good Winter Reading Program! And thanks to the Winsted Library Board, there were some great prizes to be had. Although the Winsted Library’s 2014 Winter Reading Program is now finished for the year, we hope that you found some new authors to keep you reading until the Summer Reading Program starts in mid-May! Escape With a Good Read! This winter has been a long, cold one, but there’s still time to come in to the Winsted Public Library to join our Winter Reading program readers and Escape With a Good Read! The 2014 Winter Reading program ends on Monday, March 31st. The more you read, the more chances you’ll get to win one of four great prizes! 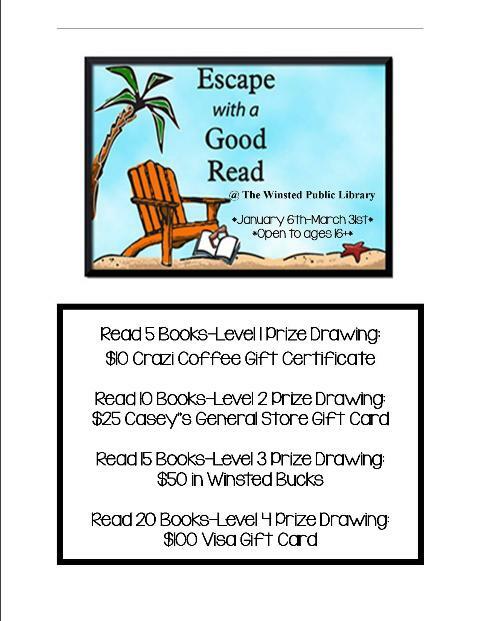 We will be drawing for prizes generously donated by our Winsted Library Commission at 7pm that evening.